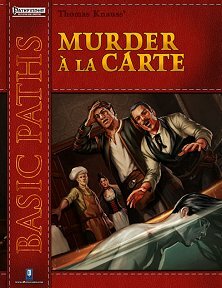 A dastardly plot to foil, written with the beginner in mind and a simplified ruleset, with notes for more experienced groups to run a fullblown Pathfinder game. Publisher's blurb: "Gafolweed's resident legendary adventurer and renowned author, Marcellus Drake is dead, and he named you as the heirs to his vast fortune. But the last will and testament reveals one shocking surprise - Marcellus prearranged his murder with someone else and that person is with you right now in the very same room. In order to inherit Marcellus' estate, you must unmask the killer. More importantly, you must surface the evening in his mysterious mansion replete with a cast of dangerous suspects, cryptic clues, secret passages, lethal traps and deadly guardians. "Does the party have what it takes to solve Marcellus' murder and claim their just reward?"